We wish The Lounge Bar was open during the day at the weekends, because we’d go there all the time. It used to be; a few years ago our favourite thing to do would be to turn up with the Sunday papers in tow and pick at tapas all afternoon long. Alas, the owners have a life too, and need some rest time of their own. The Lounge Bar opened 9 years ago and has been consistently successful ever since. Run by a husband and wife team, Philippe cooks up a storm in the kitchen while Manuela holts the fort in the dining area. They are, so far, the friendliest restaurant team we know. They welcome everyone, new or regular, with the same warmth you’d offer to a family member. The restaurant decor is simplistic but warm and cosy, like a family dining room. There isn’t the biggest array of lagers and wine but plenty enough. Besides, they make their own sangria and it’s definitely worth a taste. We’re creatures of habit when we visit, ordering pretty much the same thing every time; patatas bravas, chorizo in wine, meatballs, panna catalana, occasionally opting for garlic chilli prawns. We know what we like there and it always tastes good. In particular, the patatas bravas, a plate of potatoes topped with a spicy tomato sauce that we actually took for granted until we saw what most tapas places in Spain offered. Their version consisted of potatoes with ketchup and mayo squirted on top. Tasteless and utterly boring. 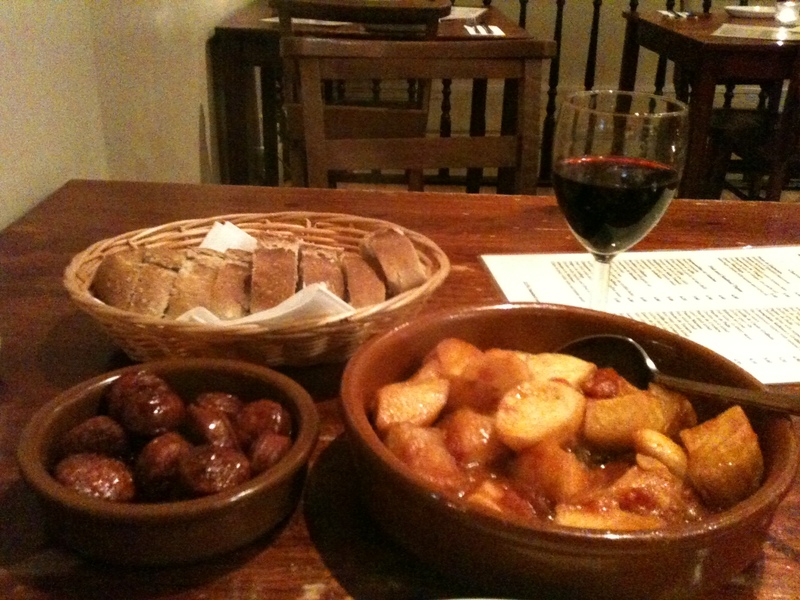 Who knew that we could get better tapas ten minutes walk from our home? The last few times we’ve visited we’ll be greeted with a sample dish to try out; Philippe is always experimenting and coming up with new dishes, and quite frankly we’re willing guinea pigs. They’ve recently introduced a specials board to boost their menu, too. We decided to mix up our usual choices with some new ones. First up, the specials board; pigs trotters. Not to everyone’s taste, but we were willing to give it a go. Between the two of us, opinion was split. They’d been slow cooked, so the fat and meat was soft and tender. The soft nature of the fat wasn’t personally to my taste but our date for the night couldn’t get enough of them. My favourite part of it? The sauce. You might think that’s a bit of a cop out but it was delicious; spicy and full of depth. Next up, mushrooms with mince and cheese. A random combination but it worked for us. 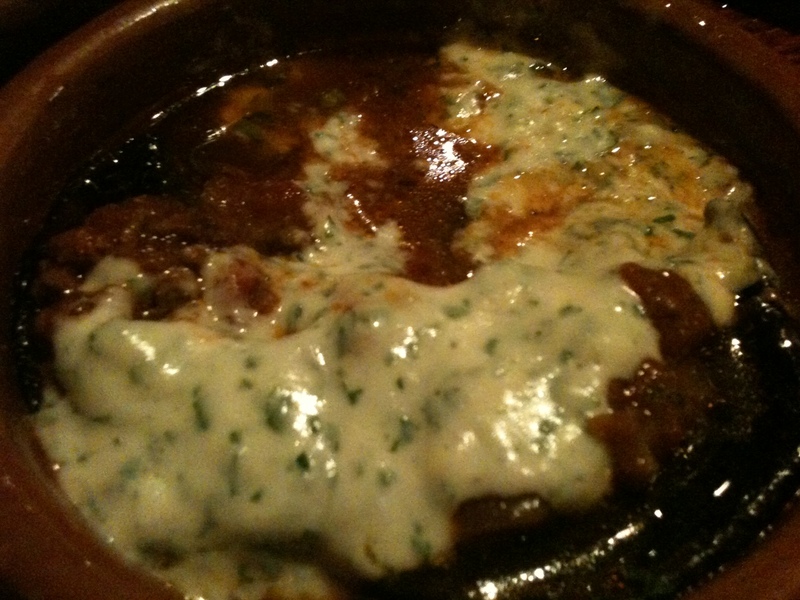 Two portobello mushrooms with a layer of tender mince, coated in cream cheese with herbs. Perhaps the nearest to vegetarian we’re going to get. 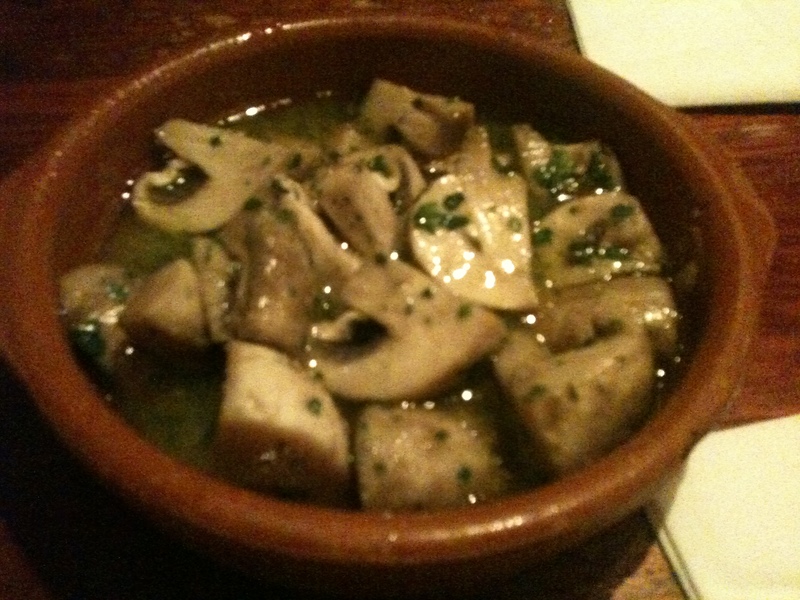 Our other mushroom offering were quartered and soaked in a sauce of garlic, olive oil and parsley. The mushrooms were really substantial; they hadn’t shrunk in size and had retained their texture instead of shrivelling up, plus the mushrooms soaked up plenty of the sauce giving a usually blank canvas a whole lot of flavour. Our last dish, an old favourite: chorizo. 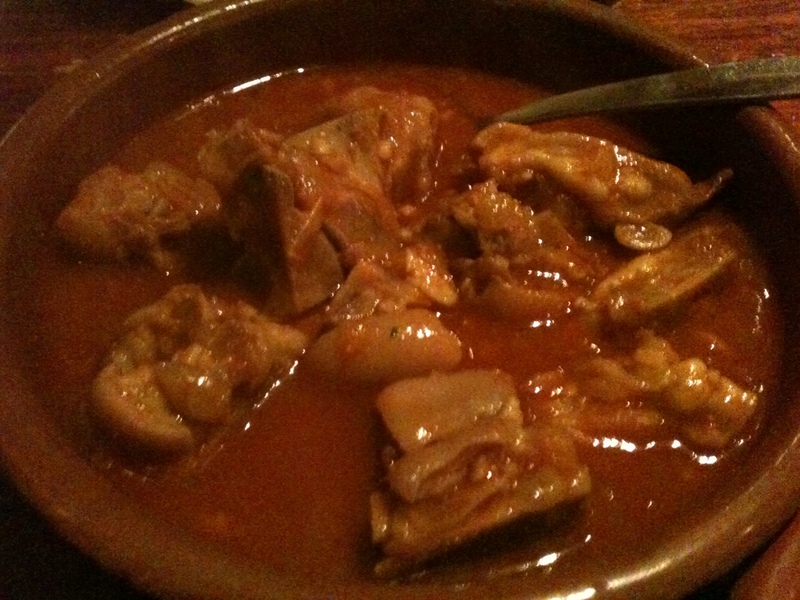 Plump discs of the spicy meat soaked in red wine, we often fight over the last slice. When the main bits of tapas are gone, we’re always left with plenty of rich sauces to mop up – always ask for bread when ordering. Prices vary according to each dish but expect to pay between £4-5 per tapas plate. We recommend you book to avoid disappointment at the weekend, as they fill up fast. They’ll always accommodate where they can though; they were happy to seat our table of 16 with 15 minutes notice on a Saturday night once! We absolutely adore The Lounge, great food and great service, they make it seem so simple. A real Balham gem.